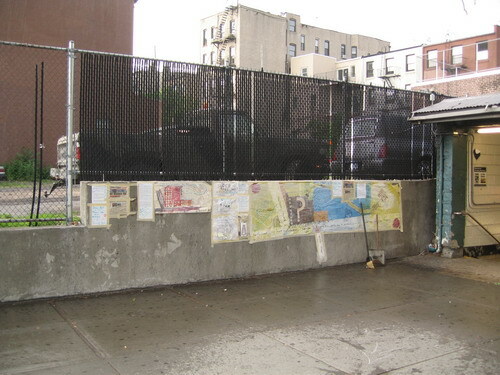 Don't look for the Battle of 360 Smith Street--the fight about a building adjacent to the Second Place entrance of the Carroll Street subway stop that would be designed by Robert Scarano and built by developer Billy Stein--to quiet down any time soon. 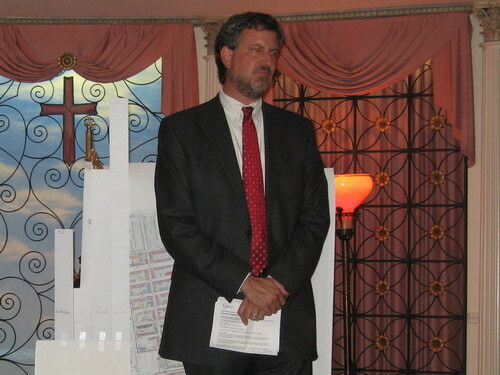 Plans for the building, and the strategy for fighting to change it, were the subject of a meeting of the Carroll Gardens Neighborhood Association last night and Council Member Bill de Blasio called on the audience to help "end the Curse of Scarano." The building would be built "as of right," which means that once Department of Buildings permits are in place, it can go forward. There is no community review. The MTA is said to have already signed off on plans for the building (this is necessary as it adjacent to the tunnel that carries the F and G trains). Residents that have talked with architect Robert Scarano say he says that a design for a metal clad building that made the rounds widely in the neighborhood "was an additional design concept," in the words of John Hatheway, who made a lengthy presentation on the plans. "He says it was never their original intention." Mr. Hatheway, who has seen revised drawings, says that the new building (which will have 46 apartments and 23 parking spaces) will be clad in a brick-color terracotta. It will be 50 feet tall on Second Place with a four-foot setback and then rise to 60 feet. A penthouse will rise to 70 feet. He described the new design has having "a funky cantilever" that seems to be a "modernist interpretation of a cornice." The Smith Street front of the building would be 60 feet high. The building was described as "South Beach in Miami architecture" at the corner of Second Place and Smith with metal balconies, big windows and "things jutting." While neighbors already got notices about a month ago that construction could begin and the parking lot on which the building would rise is slated to close on June 30, Mr. Hatheway said that "Robert Scarano is under a lot of scrutiny right now" and that the project is "likely to take a while." Resident Triada Samaras, who read an open letter to the meeting, said that the building was too big for the neighborhood. "Development is not bad," she said. "But the scale of this development is insane." Another resident, Zoe Pellegrino said that the community had to create a united opposition to negotiate with the developer for changes in the project. "We can scream and yell but they won't listen to us," she said. "The only thing we can do is unite and get someone to work with the developer in a sane way." Residents credited coverage of the project on blogs, including Gowanus Lounge, Curbed and Brownstoner for leading to the developer's willingness to have discussions with the community. Council Member de Blasio, who also mentioned the issue's extensive online coverage and the fact that online media bring issues to light immediately, said "This is a political question...I called the rally because we thought we had an opportunity to change things. " Mr. de Blasio suggested that residents continue organizing and offered to develop an action plan of e-mail and letter-writing, rallies and an online petition. "We need to take the power into our own hands," he said. He also demanded the removal of Mr. Scarano from the project. "He is someone who has routinely violated zoning, has unsafe construction sites and has violated Stop Work Ordered," he said. "To me, [the developer] can not bring Scarano into the project. Scarano is a proven bad actor." Mr. de Blasio said the community has "a chance to end the Curse of Scarano." Steal Caulk & "Rot in Hell"
The Mermaid Parade Ball at Childs!